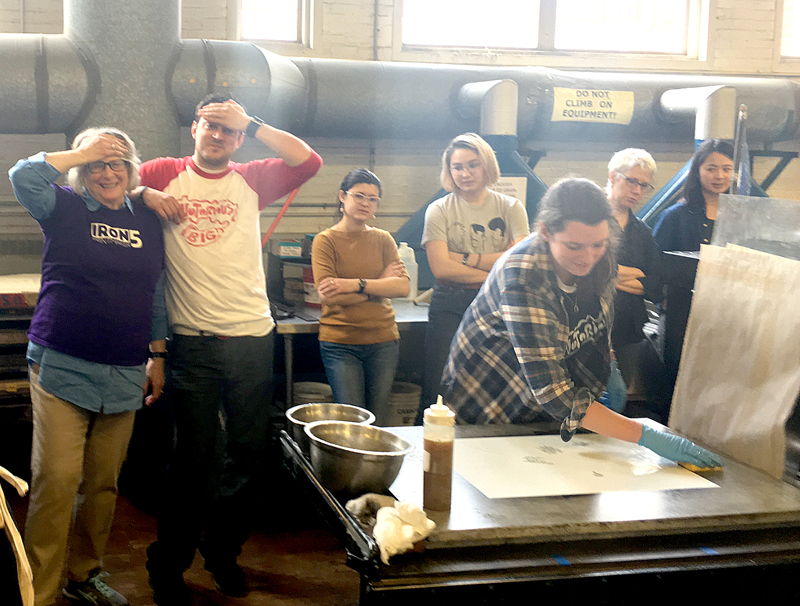 Saturday, February 25, 2017, saw the fifth annual Iron Printmakers Competition, presented by Muskat Studios and hosted by the Print Department of Mass. College of Art and Design. This has become a welcome, and increasingly necessary, rite of pre-spring. 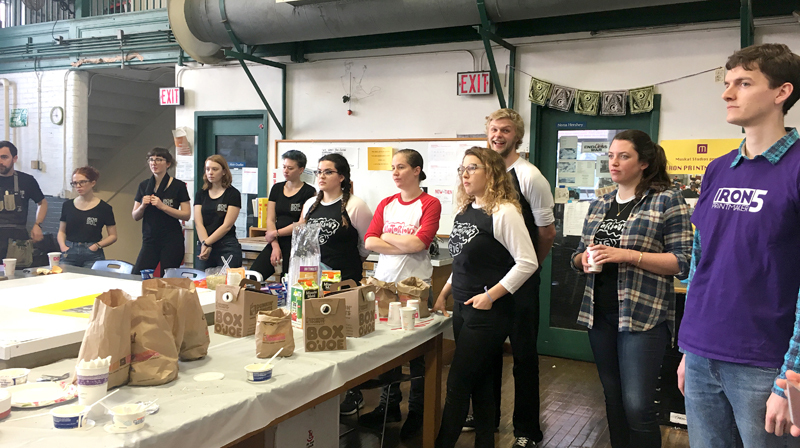 Starting at 9:00 AM and running to mid-afternoon, four teams of student printmakers scurry about like brayers with their handles cut off, attended by coaches, judges, and a host of distracting onlookers. The event is the brain-child of Carolyn Muskat, with some culinary inspiration from her husband Seth Read and, of course, Iron Chef. 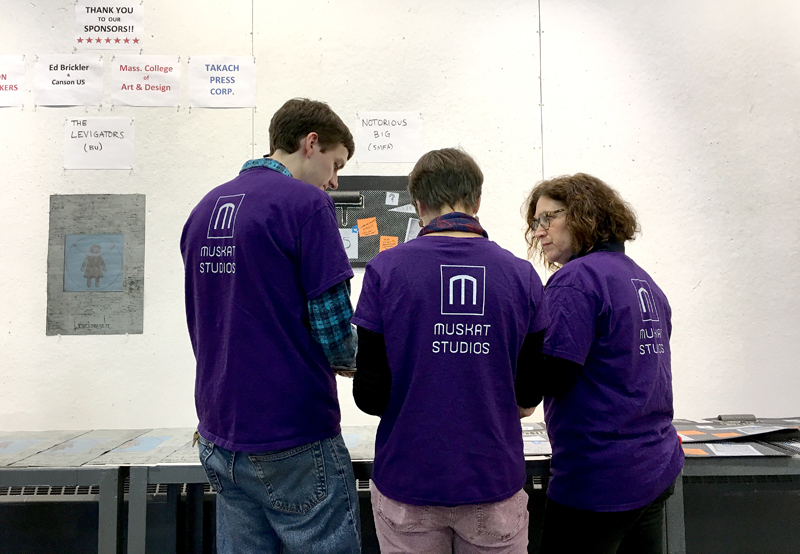 The student teams and coaches come from Boston University, Lesley University College of Art and Design, Massachusetts College of Art and Design, and The School of the Museum of Fine Arts at Tufts University. The competition is to produce an edition of 10 prints in five hours, combining all four traditional print media – litho, etching/intaglio, relief, and screen printing. In addition, they need to incorporate the infamous three mystery ingredients that are only revealed at the starting gate — this year’s secret items being 1) foam pipe insulation, 2) anti-skid shelf liner, and 3) star shaped candy molds. Teams are required to put down their etching needles and spatulas at 12:30 for lunch (catered by Seth). At the gong, they hustle back to the presses to finish and turn in the editions by the 2:30 deadline. While the panel of three judges pass the day watching sixteen students pump iron prints, their final decisions are based on quality of image, technical expertise, edition consistency, teamwork and sense of humor (in no particular order). This year’s panel of volunteer judges were Lyell Castonguay, Nancy Diessner, and Liz Shepherd. 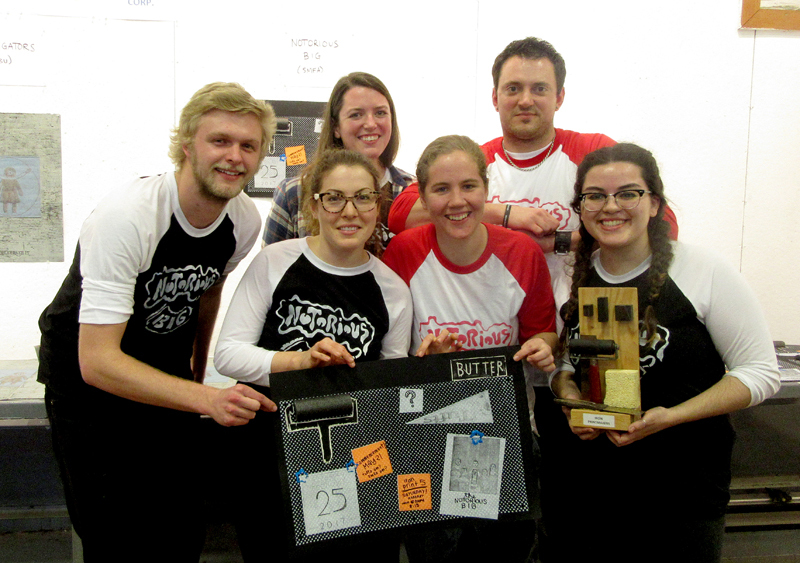 The final showdown between the BU Levigators, the LUCAD Plate Scum, Mass Art Misprints and Notorious BIG from SMFA left the Museum School holding the sacred trophy for the year with Mass Art coming in a close second. This has been a not-to-be-missed event for the print departments to mix it up, and a close rival to the Super Bowl in spectator enthusiasm. 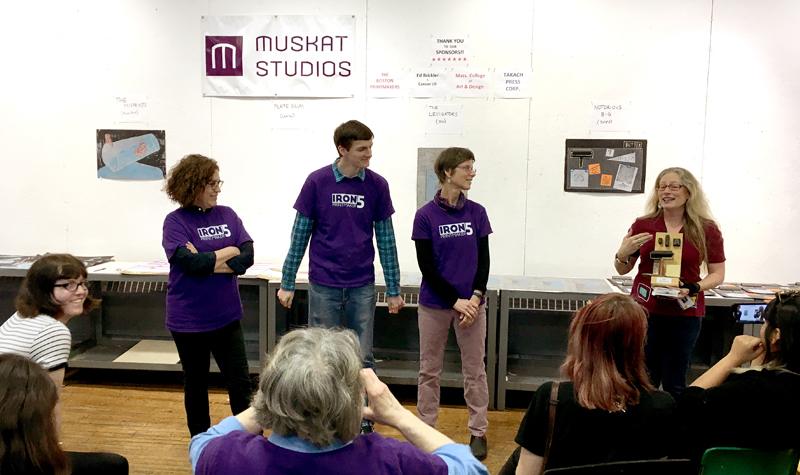 Thanks go out to Muskat Studios for their chutzpah and leadership, to Mass Art for hosting the event along with sponsors Ed Brickler with Canson US, Takach Press Corp., and The Boston Printmakers. Additional thanks go out to the volunteer judges and support staff that make this madness possible. The rumor has it that next year the lunchtime half-time show will feature Adele with the UMass Amherst Marching Band, so don’t miss it.